They don’t call it the Kingdom of Wonder for nothing! 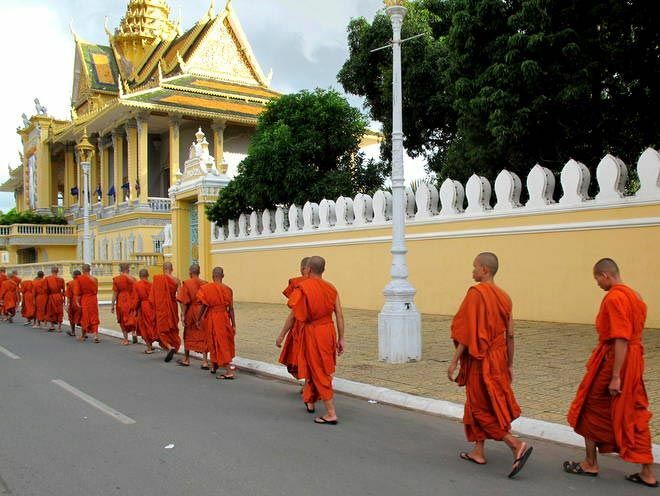 Monks outside Cambodia’s Royal Palace. 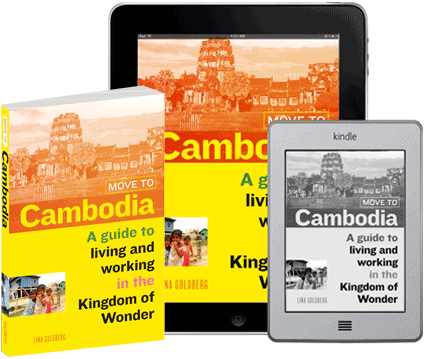 The Kingdom of Cambodia is often referred to by lazy travel writers as a “study in contradictions.” And as so often in this beautiful country, the lazy way works just fine. Cambodia is indeed filled with great contrasts, between rich and poor, countryside and city, beauty and squalor, friendliness and rudeness, heat and…well, wet heat. But those who get to know the country will likely find that, taken all together, the contradictions of Cambodia add up to something uniquely wonderful. Cambodia is in fact known as the Kingdom of Wonder and attracts more than two million international visitors each year. As more and more Westerners discover Cambodia as a great place to visit, not a few have found that it’s also a great place to live and work. The country’s thriving expat community attests to the many attractions Cambodia holds for ambitious professionals, creative types, and lotus-eating beachcombers. The low cost of living, the year-round summer weather, the friendly people, and a wealth of employment opportunities are among the many reasons foreigners have chosen to make a permanent move to Cambodia. Moreover, the red tape involved in living here and getting a job is easily dealt with, compared to most other countries. No wonder so many expats have found that the Kingdom of Wonder is the place where they can make their dreams come true. Cambodia is planted firmly in the tropics, located between Thailand, Laos, Vietnam, and a 443-kilometer coastline along the Gulf of Thailand (think beaches). The weather is always warm, although there are monsoons for parts of the year. The country is about twice the size of Portugal–181,035 square kilometers (69,898 square miles)–and divided into 24 provinces. The most populous city is Phnom Penh, which is also the capital and home to most of Cambodia’s expats. Despite the government’s best efforts to destroy or sell off Cambodia’s natural beauty, the country still has jungle rainforests, tropical islands, lush rice paddies, and temperate forests. The Tonle Sap and Mekong River are the heart and soul of Cambodia, providing food and employment for many Khmers. Cambodia has a long and tumultuous history. Sandwiched between Thailand and Vietnam, Cambodia has been pushed and pulled between them for centuries, with the more recent French and US interventions causing additional devastation. The United States’ secret war in Cambodia between 1969 and 1973 killed tens of thousands and displaced hundreds of thousands more, setting the stage for the 1975 takeover by the communist Khmer Rouge. Its attempt to forcibly transform the country into an agrarian cooperative resulted in the deaths of millions in the course of the Khmer Rouge’s four-year rule. The country is still struggling to recover from the ravages of its recent history. Today the Kingdom of Cambodia is a constitutional monarchy whose strong-man prime minister, Hun Sen, has held power since 1985, while the present monarch, King Norodom Sihamoni, was only installed in 2004. Under Hun Sen’s leadership, Cambodia has become a developing country that’s constructing more infrastructure with each passing day. There’s a large emerging middle class and a stratum of “Khmer riche” whom you’ll see aggressively driving Land Rovers and Lexuses around the city streets. However, Cambodia is also still a very poor country, even when compared to many of its neighbors in Southeast Asia. In 2010 per capita annual income was $2,470, and 25.8 percent of the population was living below the poverty line. The divide between rich and poor in Cambodia is extreme, and corruption is endemic. The population is nearly 15 million, most of whom are Khmer, although there are substantial Vietnamese and Chinese populations as well. There are also many French, Japanese, Korean, Australian, American, British, and European expats. The main language spoken is Khmer. Older Cambodians who were educated before Cambodia got its independence from France in 1953 often speak French. English, at varying proficiencies, is also widely spoken, and most young people have studied at least a little bit of English. Luckily for English speakers, there are a lot of young people: 50 percent of the country is under the age of 25. 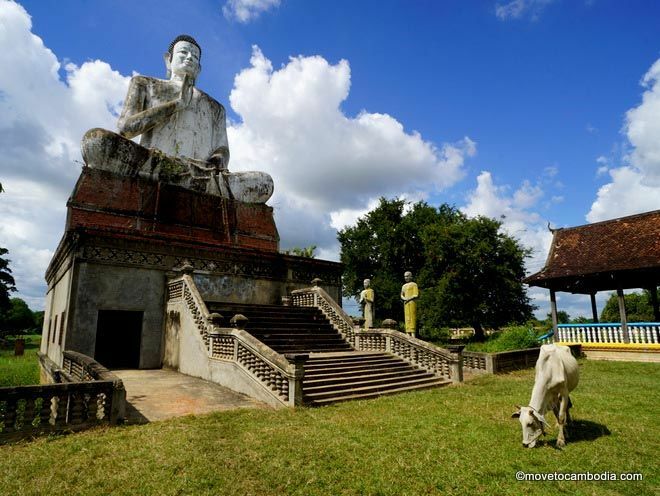 Cambodia’s official religion is Theravada Buddhism, which 95 percent of the population practices some form of. Most Cambodians are fairly relaxed when it comes to religion, although they greatly respect the many saffron-clad monks you’ll see going in and out of the hundreds of pagodas around the country. During some of the major holidays and festivals, outsiders can participate in or observe some of the ceremonies. There’s much more to learn about Cambodia and its many wonders, and no better way to learn than by living here. Whether you’ve just begun daydreaming about making a move or already have your plane ticket, we’ve pulled together just about everything you need to know.